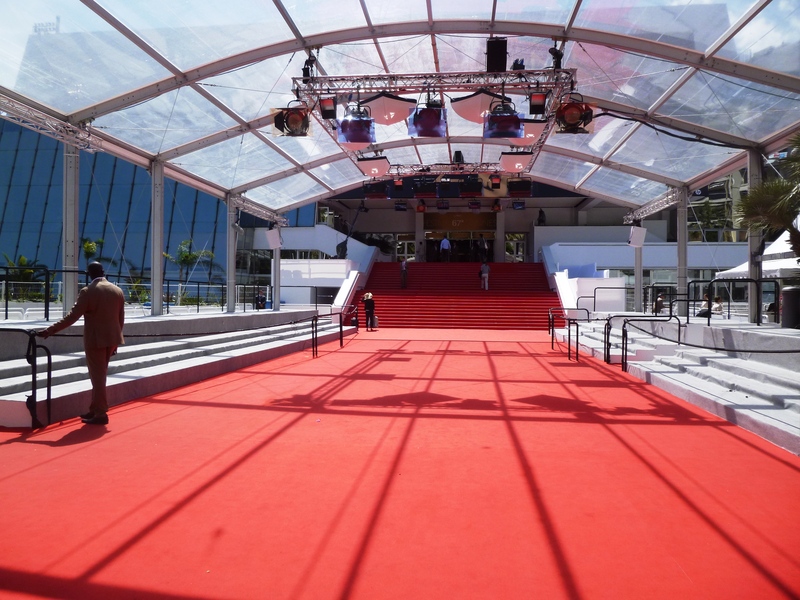 Since 1946, the Cannes Film Festival has been synonymous with the glitz of the Riviera. 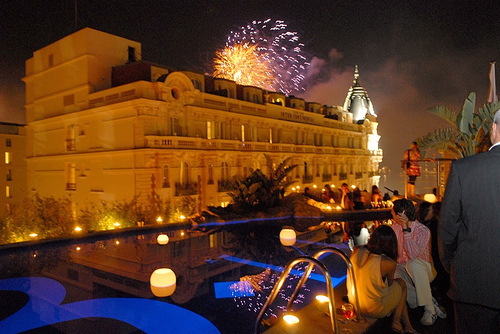 Along with the Monaco Grand Prix, which takes place pretty at the same time in May each year, it is one of the major annual events of the French Riviera and really marks the beginning of the summer season. 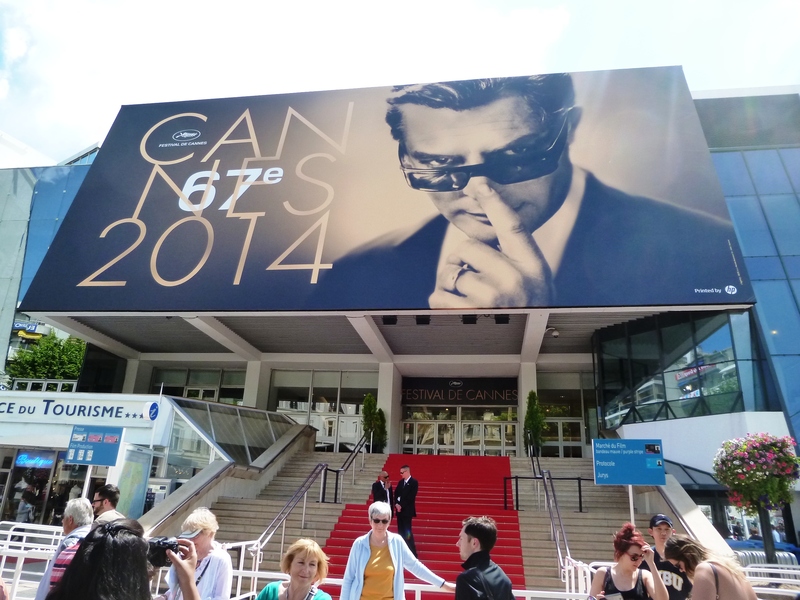 Last week I had the opportunity to visit Cannes where the jewellery brand I work for, APM Monaco, was sponsoring several events at the 67th edition of the Festival and therefore managed to soak up some of the atmosphere of this legendary event, which I will be sharing in this article. 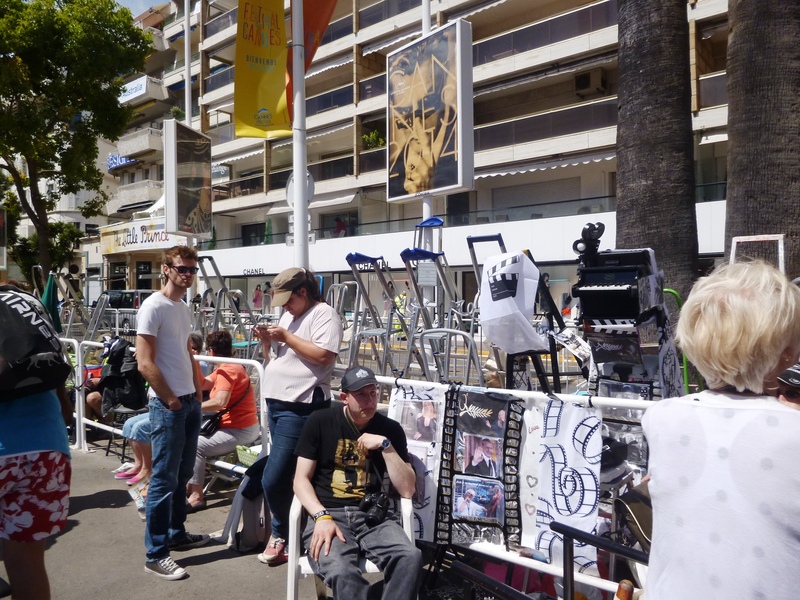 So if you fancy discovering the lowdown on the Festival, finding out what else to see and do in the town and get some practical information on how to cope in Cannes during the festival amongst the crowds, just carry on reading! Cannes doesn’t really have much ancient history, unlike nearby Fréjus, Antibes or Nice: the Romans built a small settlement on the hill called Canoïs where the old town of Le Suquet is currently located and set up a small harbour just below, but quickly left as the terrain was too swampy. After this, not much happened for the next 2000-odd years: Cannes developed into a sleepy fishing village which was under the administration of the Counts of Provence and stayed that way until 1834 when a distinguished British nobleman called Lord Brougham was blocked there due to a cholera epidemic on his way to Nice. He was seduced by the lovely climate and geographical setting and decided to build a villa there, bringing some of his friends from the aristocracy along and thereby creating a domino effect, transforming Cannes into a winter resort during the Belle Epoque and then a summer resort during the 1930s. And who can blame these people? The town is located in a superb environment, inside a wide bay with a 7.5km stretch of fine sand (one of the only areas on the Riviera with the real stuff) and a lovely view over the red rocks of the Esterel volcanic mountain range in the distance. In the late 1930s, cinema lovers developed plans to set up a rival film festival to the Mostra of Venice, which at the time was full of fascist propaganda. 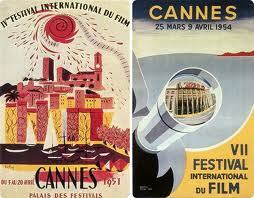 After the small matter of World War II in between, an association was set up to create a new film festival in Cannes and it immediately became one of the world’s most glamorous meetings of modern cinema, with plenty of high points and also several controversies typical of the art world. 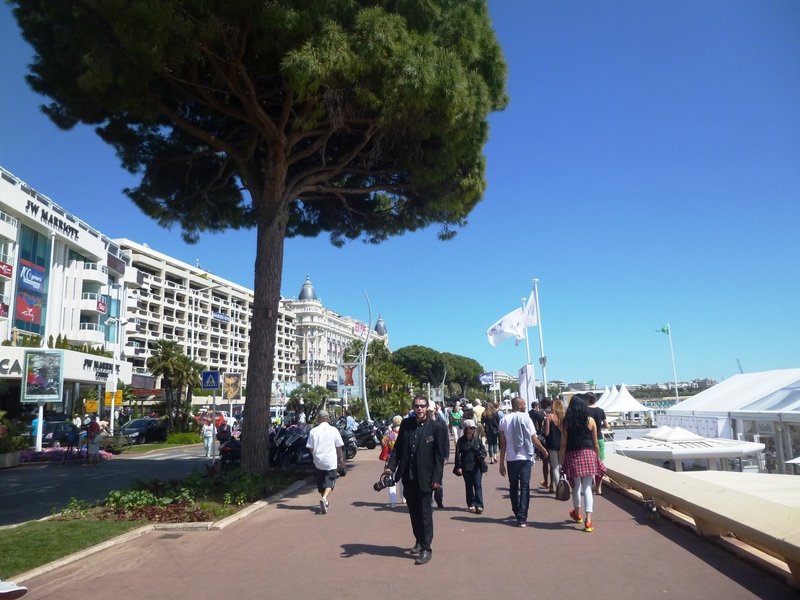 Today, the Festival is unique in the sense that it blends together some major Hollywood productions (and therefore their stars) as well as art house films from Europe and elsewhere – add to this mix a glamorous setting and the perfect late spring climate on the Riviera and this explains why the Cannes Film Festival still attracts tens of thousands of cinema-lovers from around the world. 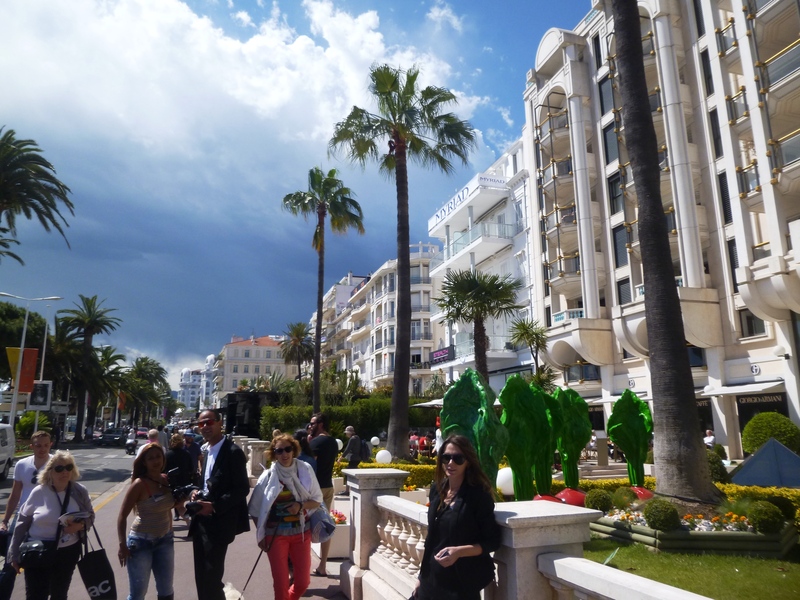 Over the years, the Festival has also become a huge business platform, where films are shown in private screenings and then sold to distributors, which is why large swathes of the Croisette, the main waterfront boulevard of Cannes, are taken over by the major film studios – some purists will say that the Festival has lost some of its soul due to the lure of big business but at the end of the day, that’s how the world works nowadays so if the Festival is good for the global economy, I don’t see anything wrong with that! The Festival itself is reserved for professionals only, so unless you work in the film industry and have one of the precious all-access badges, it is nigh on impossible to get anywhere close to the film screenings or into the lobbies of the major hotels to see the stars having breakfast. Only Cannes residents (who pay some of the highest local taxes in France) have the opportunity to apply for invitations via a kind of lottery. Also, if you love films and are really desperate to attend a screening, you can always try to send a written request to the Cannes Cinéphiles association (website in French only) which has around 4.000 passes each year. All the information about the Festival is on the official website. Each year, there is an official selection of films (the top prize being the legendary Palme d’Or, followed by the Grand Prix du Jury) and a parallel selection of more leftfield films called “Un Certain Regard”. 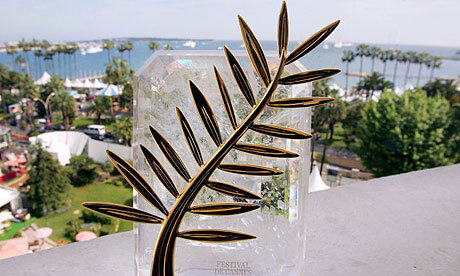 The top prizes are selected by a jury of actors, producers or directors that changes each year and are awarded during a glitzy ceremony in the main auditorium on the final day of the Festival, generally on the Saturday evening, the day before the Monaco Grand Prix (in 2014, this will be on 24 May). – Take a peek at the Palais des Festivals: this huge bunker-like building, built in 1983 and extended in 1999 is the real nerve centre of the Festival and is located in the very heart of the city, at the western end of the Croisette waterfront boulevard and just before the main harbour. This is where all the official screenings take place and especially where the stars climb up the famous red carpet steps to get into the screening rooms in the evening, surrounded by paparazzi and screaming fans. If you want to join in and scream at your favourite film stars for a few seconds, get there pretty early, the stars tend to arrive from 7pm onwards. As you can see, some “professional” groupies have it all planned out weeks beforehand! Strategic planning is required to get the best shots of the red carpet every evening! – Wander along the Boulevard de la Croisette between the Palais des Festivals and the Martinez Hotel and soak in the atmosphere – most of the wide expanse of sandy beaches is covered up during the festival by private structures, guarded by security guards, especially the private beaches belonging to the main luxury palaces such as the Majestic Barrière, the Carlton Intercontinental or the Grand Hyatt Martinez. Despite this, you can still enjoy the buzzing atmosphere as well as the stunning Belle Epoque architecture of the boulevard and the great view over the Esterel mountains, the old town of Le Suquet and the Ile Sainte Marguerite across the sea. Cross the road and you’ll be able to see the ubiquitous luxury stores such as Chanel, Vuitton which you can find all over the Riviera. 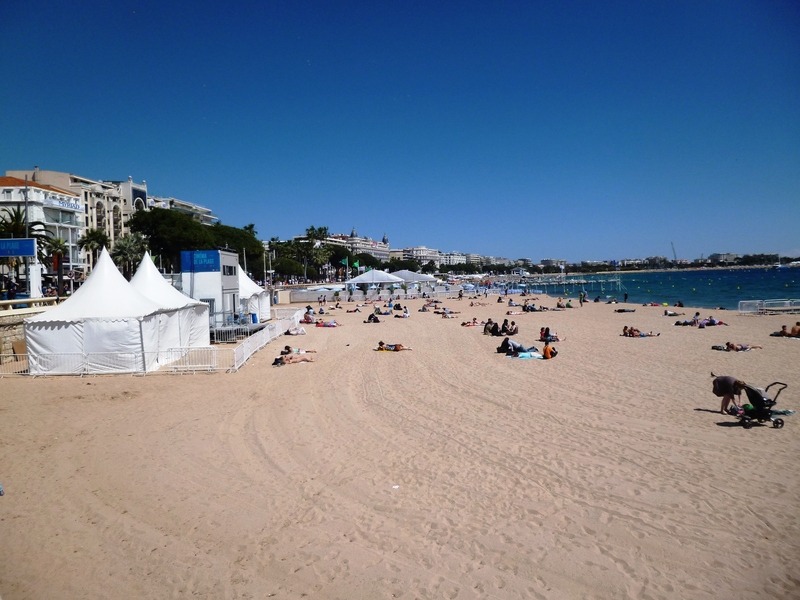 – Attend one of the showings at the Cinéma de la Plage. 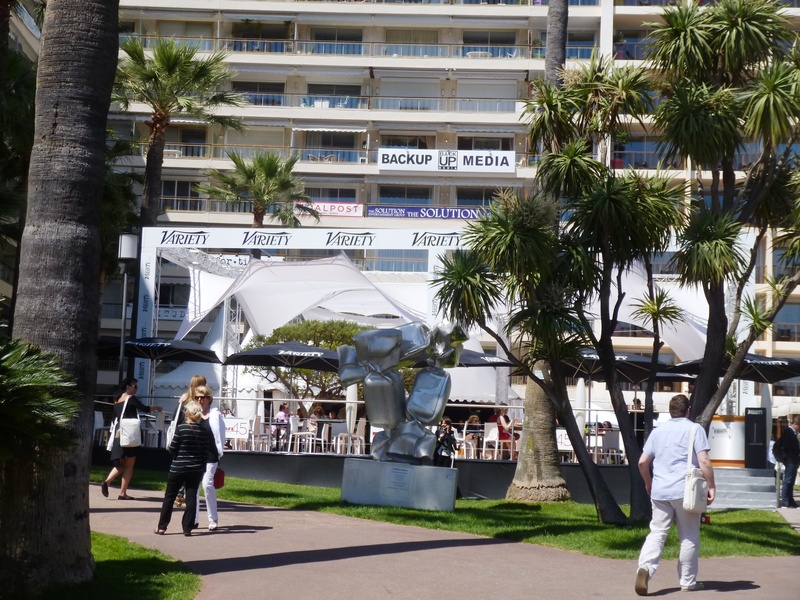 The Cannes Festival organisers organise a special screening each night of a classical film in a lovely open-air setting by the beach. 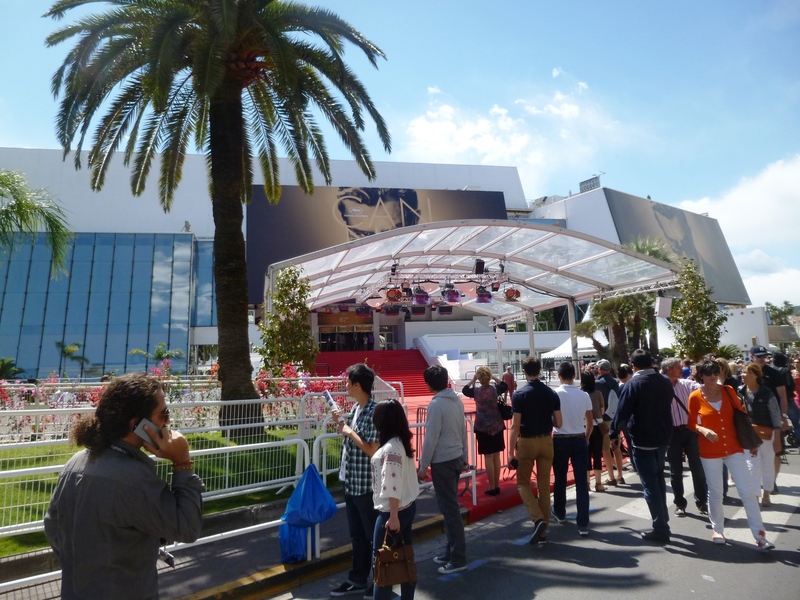 The sessions are free but you need to pick up invitation tickets at the Cannes tourist office, conveniently located just underneath the Palais des Festivals. This entertaining article in a British newspaper about this year’s of Federico Fellini’s classic film 8 ½ gives a good idea of what a projection at the Cinéma de la Plage is like, so don’t miss it if you are spending an evening in Cannes. The Cinema de la Plage, located just next to the Majestic Plage, entirely free, ideal to revise the great classics! – Enjoy the nighlife! 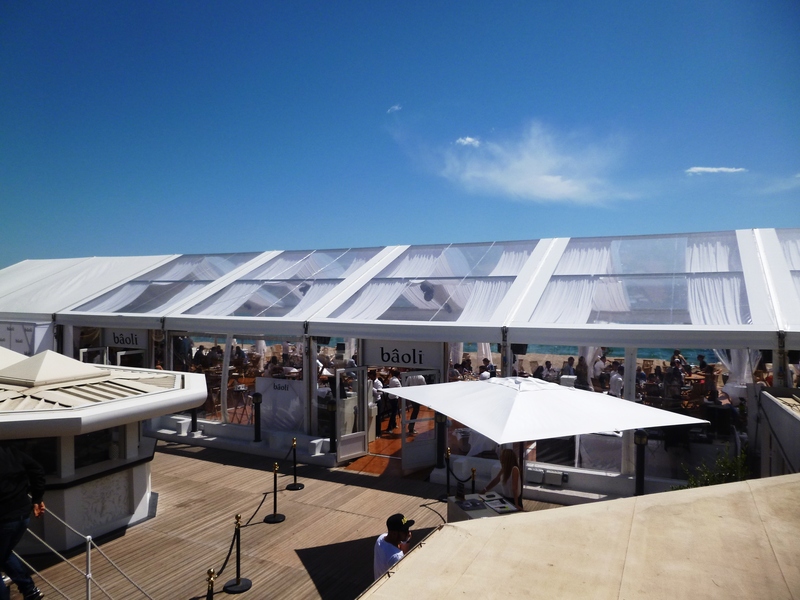 There are plenty of fun parties going on in Cannes during the Festival, be it for product launches, film promotions or the birthday party of one of the stars. Naturally, you’ll need a special invitation to all of these events, but there are plenty of major nightclubs in Cannes where you can enjoy the special festival atmosphere, even though you need to have a well-garnished wallet to get in, One of the most famous and exclusive nightclubs in Cannes is le Bâoli located on Port Canto (on the opposite tip of the Croisette from the Palais des Festivals, past the Martinez Hotel), though I can’t really review it as I haven’t been there. 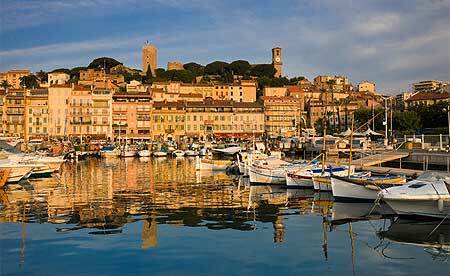 – Wander up the the Old Town (Le Suquet), located west of the Palais des Festivals and dominating the old port, to check out the medieval atmosphere of its narrow streets and some nice views over the bay. This is also the area which has the most interesting (this means the least touristy) restaurants. – Take a boat trip to the Iles de Lérins: the two islands located a short boat trip away in the Bay of Cannes are ideal for a day trip. 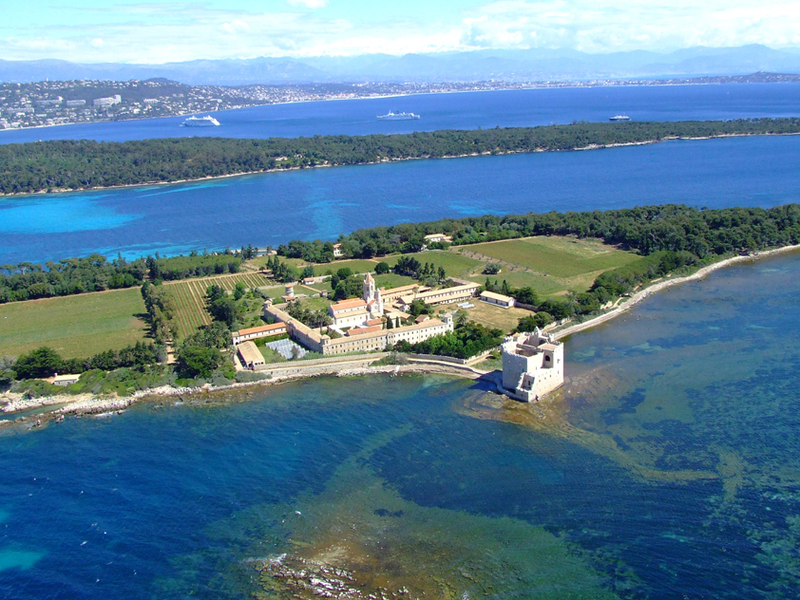 Ile Sainte Marguerite, the larger of the two, is famous for its fortress prison, the Fort Royal where the man in the Iron Mask was allegedly held and is a very pleasant place to walk around and to swim, with nice secluded beaches. The smaller Ile Saint Honorat on the other hand houses a community of monks in the Abbey of Lérins. To get to both islands, there are regular boats from the old port of Cannes (below Le Suquet) but surprisingly none between the two islands: Trans Cote d’Azur for Ile Sainte Marguerite and Compagnie Planaria for Ile Saint Honorat. 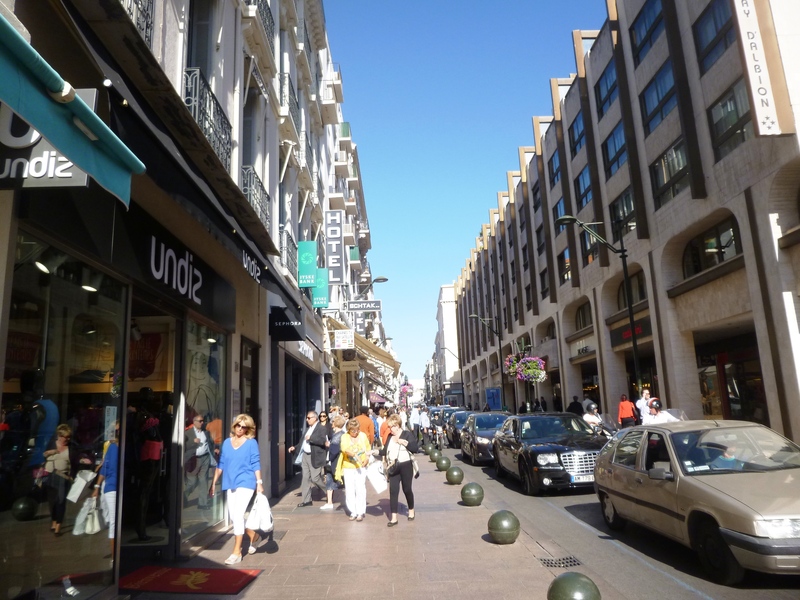 – Wander around the main shopping street of rue d’Antibes (parallel to the Croisette, before the railway station), to see some of the main fashion stores, much more accessible than the luxury brands located on the Croisette! 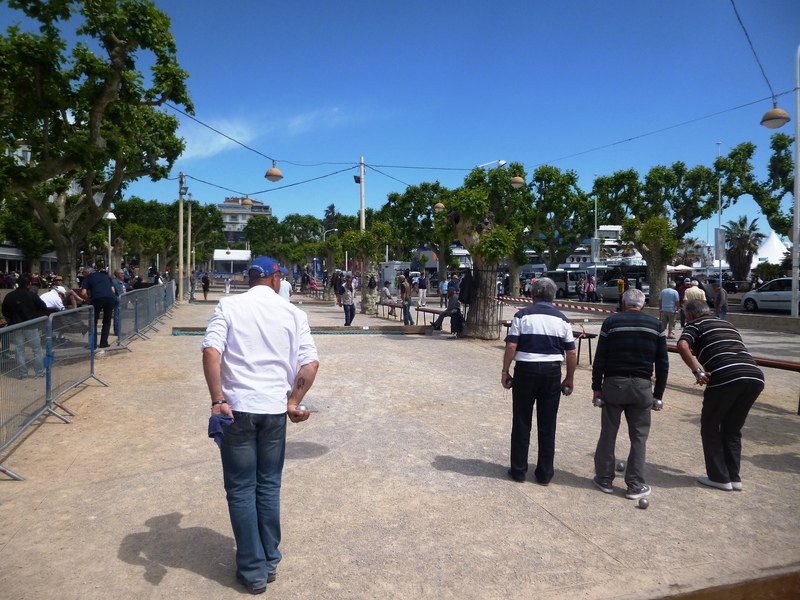 And then have a wander on the quaint Place de l’Etang across from the Palais des Festivals to sample some Provençal atmosphere whilst watching the old locals playing pétanque. 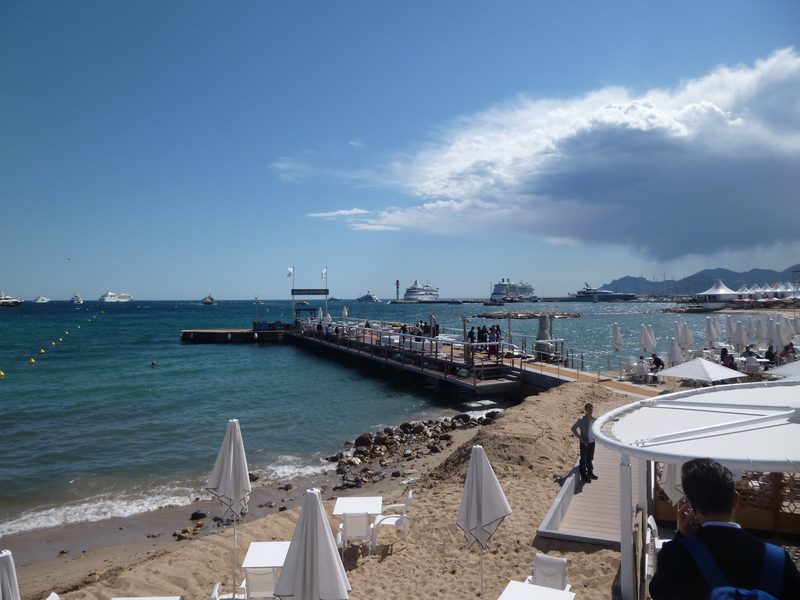 I’ll be visiting Cannes again sometime this summer for a more detailed report about the city outside of the Festival period so please follow the blog for more information! 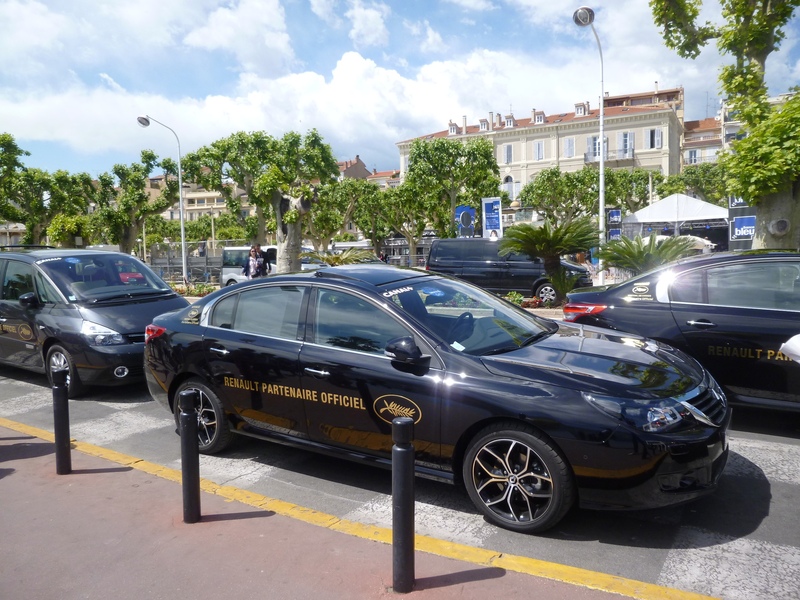 – By car or by bus: a nightmare due to the traffic getting off the motorway and it’s very difficult to park in the centre of Cannes where the public car parks are hideously expensive. The same applies for the bus lines into the city due to the traffic, but at least they cost less. – By taxi: budget around 150€ to get to Nice, cash only, no comment! You’ll notice that there’s no recommended restaurant section at the end of this article… That’s because Cannes isn’t particularly renowned for its good food and most places tend to be rather touristy – however, you can find the best concentration of more authentic restaurants either in Le Suquet (the Old Town) or around rue du Commandant André, a street perpendicular to the Croisette between the Majestic and Marriott hotels, which also houses plenty of nice bars (and the APM Monaco jewellery store at number 20, stop by on my behalf!). I’ll check out some places upon my next visit. In the meantime, if you have any suggestions or more general comments about this article, please let me know in the meantime and fill in the comments form below. This entry was posted in The coastline west of Nice and tagged APM Monaco, Baoli, Boulevard de la Croisette, cannes, cannes film festival, Cannes Film Festivals, Carlton Hotel, Côte d'Azur, Croisette, film festival in Cannes, french riviera, frenchriviera, Ile Saint Honorat, Ile Sainte Marguerite, Iles de Lérins, le suquet, Majestic, Majestic Plage, Palais des Festivals, place de l'étang, rue d'Antibes, sandy beach Riviera, the Boulevard de la Croisette. Bookmark the permalink.